QV 9d brown/white PSE cut-out piece pmk'd blue oval of bars applied on arrival. 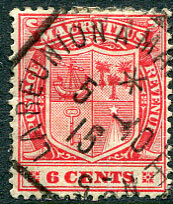 (K1) on 1863 QV 4d rose Crown CC wmk (SG.62), perf. faults along top. 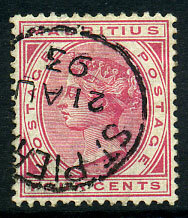 on 1860 QV 9d dull purple No wmk (SG.51, Cat.£42), straight edge at right. 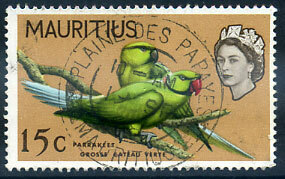 (Hosking 1344 applied Port Louis) on Seychelles KGV 12c (SG.108). 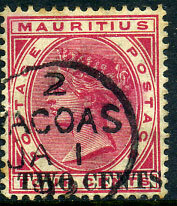 (T.2) code "2" (normally A or C) dated 2/JA 1 92 on 1891 TWO CENTS on QV 4c carmine (SG.118). 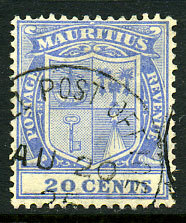 on 1860 QV 2d blue No wmk (SG.47), perf. defect at left and small thin at top. 19 SP 68 on QE2 15c (SG.322). 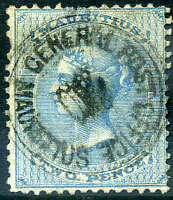 on 1863-72 QV 2d pale blue CC wmk (SG.59), very rare on this. 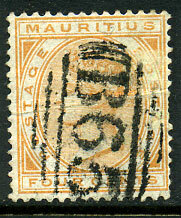 on 1899 6c on 18c (SG.134), very rare on this. part dated 30 ?? 67 on QE2 5c (SG.320). 14 MR 66 on QE2 5c (SG.320). (T.2) JY 17 93 on QV 1c on 2c pale violet (SG.123). (T.1) DE 31 87 on QV 2c (SG.103). 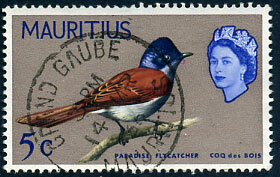 (T.4) in red ink dated MA 28 13 on 2c (SG.165), rare as such. 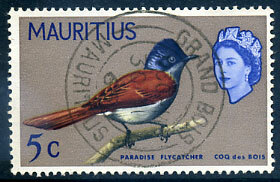 (T.3) DE 19 97 on QV 1c pale violet (SG.101), rarely seen. (T.2) A/VACOAS/MY 3 92 on QV 2c (SG.103). 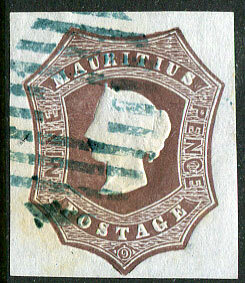 (T.3) A/MR 18 96 on QV 4c carmine (SG.105). on QV 4c Crown CA wmk (SG.105), thinned and with perf. defects at right. (T.1) OC 16 93 on QV 4c (SG.105). (T.1) NO 23 93 on QV 15c (SG.107). (T.3) C/MR 22 95 on QV 2c (SG.103). (T.5) AU 20 25 on 20c (SG.220). (T.1) 21 AU 93 on QV 4c (SG.105). on QV 4c orange CC wmk (SG.93), creased.